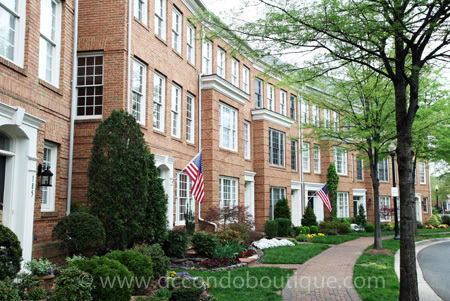 Located in the West End of Alexandria, Virginia, Cameron Station is a master planned community comprising single-family homes, town homes and condominiums. Inspired by the architectural styles of the 18th and 19th century, the community blends the charm of brick sidewalks and colonial street lamps with the convenience of modern living. The neighborhood is bordered by two city parks at each end -- Ben Brenman Park and Armistead L. Boothe Park -- home to athletic playing fields and children's playgrounds. At the heart of the community, the Cameron Club Community Center features a fitness center and gym, children's pool and a number of rooms available for business meetings and social gatherings. In addition to recreational opportunities and green spaces, Cameron Station is home to a diverse mix of retailers ranging from restaurants and a grocery market to dry cleaners, a spa, dentist, and day care facility. The central library in Alexandria -- the Charles E. Beatley Jr., Library -- is also nearby. As an added bonus, the community provides a free shuttle service for its residents to the nearby Van Dorn Metro Station during morning and evening rush hours. Cameron Station is a strong choice for urban professionals and young families - combining small town comfort with close proximity to the nation's capital.